If you are new to camping or only camp a week or two a year, you may not know some of the unwritten rules of camping. Some of these are written rules at many campgrounds or are actual laws. Most of these are common sense or follow the Golden Rule. Remember, there are others camping in the campground at the same time you are camping so we all need to be polite! While you might think your pet is the best pet in the world, others may not feel the same and might even be scared or allergic to dogs or cats. 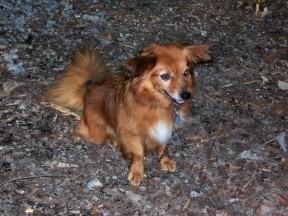 Keep your pet on a leash and don’t let them bark at or jump on others. Also, clean up after your dog. Many parks supply bags for this purpose. I know you love your music, but that doesn’t mean everyone has the same taste in music. Many people camp to hear birds or to experience quiet! If you have to play music outside, keep the sound level down so it can only be heard within your site or, better yet, use earbuds to listen to your music. Please realize that you don’t have to etch your initials to show that “you were here” or show your love to someone. Painting graffiti or cutting into trees or rocks is ugly everywhere and against the law in many places. While you can see initials in older trees that are still growing fine, cutting initials have been known to kill a tree. One national park sign listed the penalty as up to 20 years in jail and/or $20,000, since this is defacing public property. Staying on the gravel while camping in Georgia. Campers greatly affect the plants at the campsite. We all love the privacy and the shade from greenery at our campsites but we have to work to keep this for everyone. 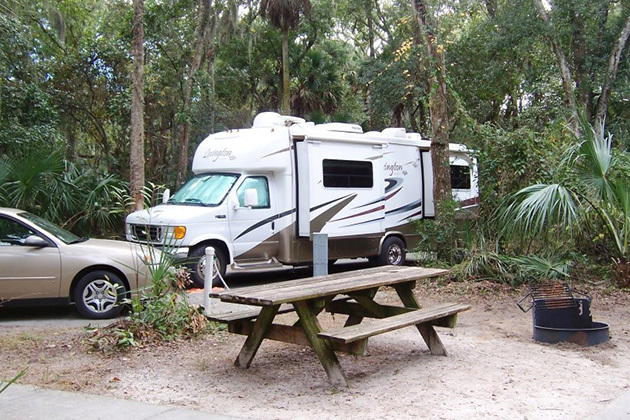 It is best to keep your vehicles off the grass when possible to keep the grass in good shape for the next camper. Some parks will ask you to move your RV or car if you are off the gravel or concrete. 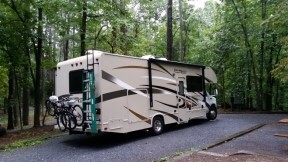 If you put out a large rug in front of your RV, try to move the rug around or remove it completely for several days so it doesn’t kill the grass. Stay on the trail, even within the campground. These extra man-made trails compress the dirt, kill off the grass and wildflowers, and prevent future trees from sprouting. Sometimes you need to wash your RV or do some maintenance. Ask if that is OK first. Some parks have special places to wash your car or have rules against it to save water or prevent soapy water discharge. Minor maintenance may be OK but not major work. Ask first. You really don’t need to have lights on outside your RV after you’ve gone in for the night. As far as I can find, there are no studies that show it makes it safer. Please realize that there are people who camp to see stars, planets, and meteors and your light is a major problem. Plus, your light may be shining into the open window of someone who is trying to sleep and enjoy a breeze. This is basic courtesy, but it is constantly ignored. Don’t walk through someone else’s campsite just because it is a shortcut. It is rude to walk within a campsite without being invited. This also means you should tell your kids this rule. Recently, I watched a group of kids play ball in a stranger’s campsite including yelling and screaming along with grabbing their ball from under the RV all while the parents sat back in their campsite and watched. Don’t! 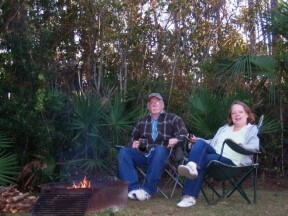 Enjoying a fire and a chat at Everglades National Park. Given all the problems with wildfires in the news, you would think this wouldn’t be a problem but I still see multiple fires in a campground without anyone in the area. Please put out your fire before you leave the campground or go to sleep at night. You may be liable for any damage if a spark from your fire spreads. A great way to enjoy yourself while camping is to sit outdoors at your camper or to walk “the loop” passing other campers. Say “hi” and chat with people…don’t ignore them! What “rules” do you think we should follow when camping?